There is a massive housing crisis across the UK as a result of Government policies. Too little social housing is being built and apart from Scotland, those that are built are being sold off. In many places rents are unaffordable and the bedroom tax has created more poverty and homelessness. Delegates backed a call for government and Labour councils to stop implementing the bedroom tax; for an end the privatisation of social housing; for enforced rent and quality controls over private landlords and for a massive social house build programme. 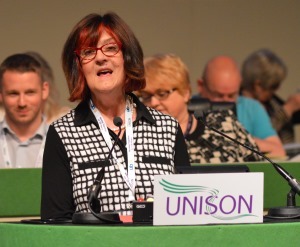 Seconding a wide ranging composite which included Aberdeenshire’s motion, first time conference speaker Ann Gray told conference that homes are for people, not profits. Ann said, “We condemn the UK Government’s housing and financial policies that have focused upon “Buy To Let” as the main source of rented housing in Scotland and across the UK. “The result has been growing inequality and poverty across Scotland and the UK, as working people struggle with ever rising housing costs, poor quality housing and insecure tenancies. She slammed the UK Government’s proposal to have another fire sale of Council and Housing Association homes, and warned that “from my own experience as a former housing officer, the lack of affordable housing marginalises people, breaks up families and ruins communities. “Homes that are affordable, secure, fit for purpose with a housing stock that is responsive to the needs of local communities are essential to a fair society,” said Ann, adding with a shudder as she spoke the name, that since the days of Thatcher the private sector has failed miserably to deliver these homes for people. She reminded delegates that the Council House and Social House building programmes in the 20th century not only housed people, they also provided jobs that helped the Scottish and UK economy to recover from the Great Depression - new secure homes that revitalised local communities, peoples’ sense of identity and offered hope to millions for a better, healthier life. Ann called for an end to the unfair bedroom tax which once again hits the most vulnerable hardest; an end to the sell-off of our public housing stock; and a campaign for a new council and social homes building programme here in Scotland and across the UK.